The 522,783 fake notes detected accounted for a mere 0.0005% of total notes in circulation. New Delhi: According to the Reserve Bank of India’s annual report for 2017-18, 99.3% of the demonetised ₹ 500 and ₹ 1000 notes have been returned to the central bank. One of the primary aims of demonetisation: of extinguishing hoards of ill-gotten currency notes thus stands unfulfilled. When it was announced in November 2016, demonetisation was proclaimed as a solution to India’s black money and counterfeit currency problems. It was later projected as a move to encourage digital payments. On all of these fronts, it is unclear if demonetisation has made significant progress. Over the last few months, the amount of cash in India has reached pre-demonetisation levels. India’s currency circulation is growing at a similar trajectory to the months before November 2016. 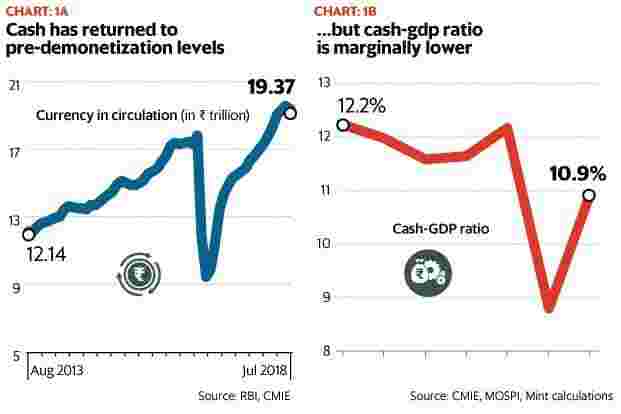 The cash-to-GDP ratio is only marginally lower compared to pre-demonetisation levels (See Chart 1B). On counterfeit money, there has been no significant change in the number of fake notes detected (See Chart 2). 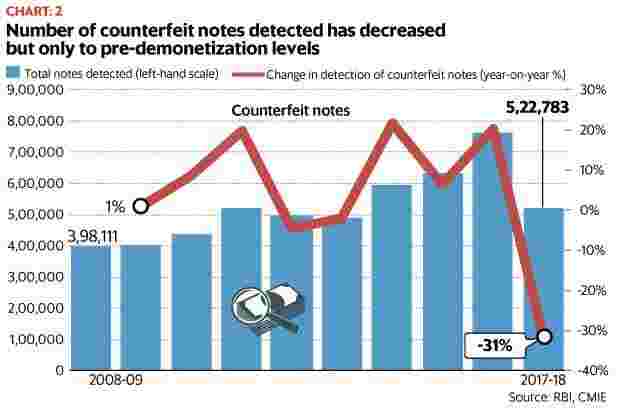 In 2017-18, the number of counterfeit notes detected was in line with pre-demonetisation levels and, more importantly, minimal in the grand scheme of India’s currency circulation. The 522,783 fake notes detected accounted for a mere 0.0005% of total currency circulation. Even on digital payments, demonetisation does not seem to have provided a significant and sustained push. 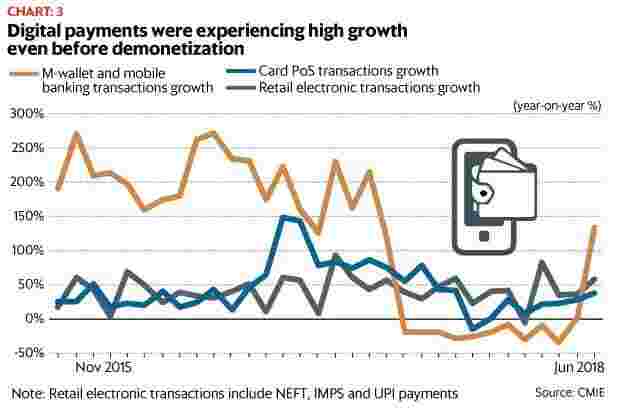 Mobile payments and card payments through PoS have increased significantly since November 2016 but they were also increasing in the months preceding demonetisation (See Chart 3). The demonetisation-induced cash crunch did increase digital payments but the years since, as cash returned, have seen more modest growth in digital payments. Demonetisation’s impact on boosting tax compliance is tricker to assess. 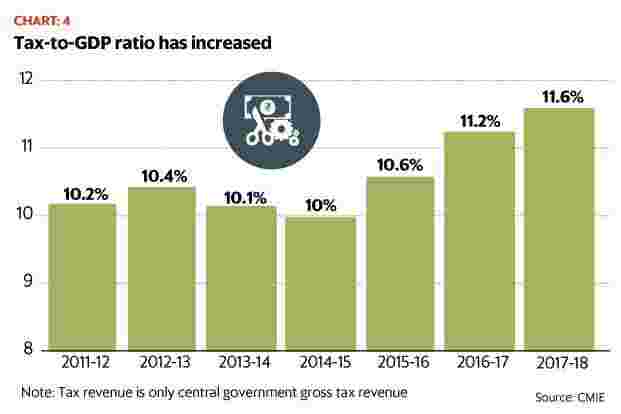 The 2018 Economic Survey suggests that demonetisation has helped increase India’s tax base, in terms of taxpayers, and this may have played some role in the increase in the tax-to-GDP ratio over the last two years (See Chart 4). While overall GDP growth may have now adjusted to the shock of demonetisation, new evidence from the World Bank highlights the scale of its local impact in the months after November 2016. Using night-time data as a proxy for economic activity, Robert Beyer and others of the South Asia office at the World Bank have measured the impact of demonetisation on different types of districts. 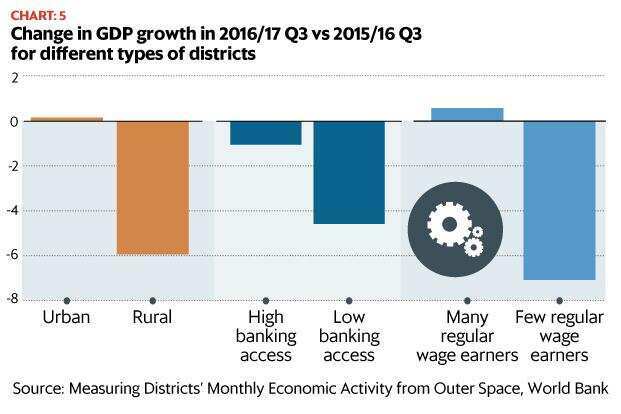 Unsurprisingly, they find that demonetisation’s impact was biggest in rural districts with lower banking access and more informal workers (See Chart 5). These districts grew at a significantly slower rate in the quarter after demonetisation and, while the shock was only temporary, the short-term local impact was sizeable. Taken together, the costs of demonetisation seem to outweigh the benefits.